It’s showtime at Mo-Zam-Bik Gateway! 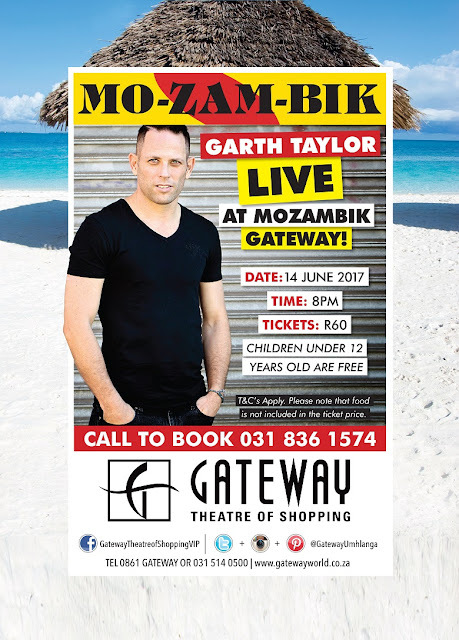 For one-night-only, bring your family and friends for a first-class – and long-awaited – performance by Garth Taylor on Wednesday, 14 June, 2017. Garth Taylor will be showcasing all his original hits plus some all-time current favourites. “I have a power-packed show planned which includes my latest singles that have been playing across Durban radio,” says an excited Garth Taylor. “It’s been too long since I last performed in Durban,” he adds. Garth released his fourth studio album last year. Made is a 10-track album jam-packed with all original soulful pop and R&B hits and is available to purchase on iTunes and Look & Listen stores. While the album does boast a bevy of tracks with Garth’s signature soulful sound, fans will also be pleasantly surprised with a few dance tracks. Durban-born, Garth Taylor, burst onto the scene in 1998 when he topped the radio charts for five consecutive weeks with Why and this song is still a timeless classic. This SAMA-nominated singer/songwriter exceptional talent has made him one of SA’s most prominent artists. Garth has a tremendous stage presence and audiences can expect an unforgettable experience. His top-class live performances have earned him spots on many big stages around the globe. The show starts at 20h00 and fans are encouraged to book early to avoid disappointment. Tickets cost R60 per person (children under 12 are free / ticket price does not include food). For bookings, call 031 836 1574. Mo-Zam-Bik Gateway is located at F183, Gateway Theatre of Shopping, 1 Palm Boulevard, Umhlanga Ridge, Umhlanga.